In the world of modern comics for the past thirty years, three names often come up that are both commercial successes as well as very beloved superstar creators renowned for their originality and appeal, particularly amongst pagan and polytheist audiences: Neil Gaiman, Alan Moore, and Grant Morrison. While I have explored the comic (and other) works of Gaiman and Moore quite extensively, I had not read anything by Morrison until this past year, when I read the entirety of The Invisibles. I’d certainly heard about Morrison and The Invisibles (as well as some of his other titles) for many years before that, and knew that he is also a practitioner of magic, but nonetheless it took me a while to get to actually reading his work for a variety of reasons. 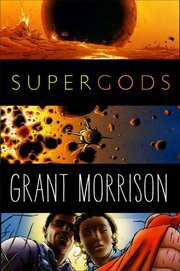 After having read and enjoyed The Invisibles tremendously, I was filled with anticipation when I heard that Morrison would be writing a book on comics with the title Supergods. While I did enjoy this book very much, and found it both engaging as well as informative, I was also disappointed with it for a very specific set of reasons. With a title like Supergods, and its rather extravagant subtitle, I expected this might be a book like Christopher Knowles’ Our Gods Wear Spandex, only written by an insider/practitioner. It isn’t remotely like that. While what the book actually is and contains is wonderful, I think the title is a bit misleading, and I would have advised against using it personally. The majority of the book is about the history of superhero comics, some of the controversies that have emerged in relation to them (particularly in the late “Golden Age” period), and their transformations from the late 1930s to the present. A large portion of the history during the past nearly-fifty years intertwines with Morrison’s own reflections on his life at various stages, and his subsequent direct involvement with the comics world from the 1980s onwards. It is engaging and intriguing and very enjoyably written, and I could have even done with more personal and autobiographical asides, or even entire chapters. The idea of the “fiction suit,” which Morrison pioneered in both Animal Man and, far more dramatically and life-alteringly, in The Invisibles is certainly fodder for an entire treatise in itself; and the use of the latter series as a “hypersigil” would also bear further elaboration at some point in the future by the innovator and master of these techniques himself. Morrison severely critiques the “Dark Age” treatment of many superhero characters, making them more human with common everyday problems and often overly gritty and “realistic” dimensions, which largely resulted from the phenomenal success of Alan Moore’s Watchmen. Morrison essentially concludes that if one has superheroes with powers, whether derived from alien origins, mutations, magic words, or cosmic rays (or any number of other things), why then bother with trying to make them “more realistic” in order to, in some sense, make them “less super” and more accessible or sympathetic for their all-too-human readers? While this critique is a well-founded one, and stands on its own, it would have helped a bit if Morrison had given a bit more information on his own conflicts with Moore in the process. (The documentary about Morrison, Talking With Gods, does give more information on this.) These conflicts are not only a relevant part of the history of comics in the “Dark Age,” but they would have given his narrative a context that would have gone very far in alleviating the rather resentful, sour-grapes-esque tone of some parts of this work. Morrison is an extremely phenomenally successful comics writer himself, and has had many more years of experience in magic than Moore did since “coming out” as a magician in the early 1990s, and thus Morrison has nothing to feel resentful about or jealous over, in my opinion. The discussion at this point could therefore have been largely one on philosophical differences, which I think would have helped those who aren’t aware of the exact details of Morrison and Moore’s “feud” very much. While Morrison certainly does get into some mythological and theological language and discussion at various points, some of it is frustrating for other reasons. He generally takes the viewpoint that Superman is the “Apollonian” hero, whereas Batman is the “Dionysian”; but he introduces a discussion of Hermes and the other linguistically-associated deities in his discussion of the first issue of Action Comics featuring Superman on the cover, and then later discusses Batman’s alter ego Bruce Wayne as a “Plutonic” figure. There is certainly some precedent for closely connecting Hades/Pluto to Dionysos, of course, but there isn’t as much of one for connecting Hermes and Apollo. Playing rather fast and loose with deity-based adjectives, but not really explaining what he means with them and assuming that a general reader will understand them, is rather disappointing, and perhaps expecting a bit much of a general audience. His discussion of Hermes and the other language and/or boundary gods on pages 7 and 30 (including Ganesh, Legba, Thoth, Nabu, Ogma, and Odin) is essentially soft polytheism, and while a number of these deities were connected to one another through interpretatio Romana or Graeca at one point or another, the case for Ogma, for example, is far less certain. Ogma is an Irish deity (note, not a “Celtic” one — there is a difference! ), and while he is credited with having invented the ogam alphabet, he is primarily known as a warrior. When Morrison discusses the influx of British writers and artists into the American comics scene in the 1980s on page 188, he compares it to “Romans in Britain delivering their gods into the hands of the Celts for a revamp.” This is not really what happened during the Romano-British period: instead, the Romans exercised their own interpretive powers on the native British deities and connected them to their own; the majority of Romano-British remains are from Romans, not Britons. On page 292, he discusses the similarity of one character in the Justice League of America series to Blodeuedd from the Fourth Branch of the Mabinogi, whom he describes as having been created by “the sorcerers Math and Gwydion … to deceive and destroy the Welsh mythic superhero Lleu Llaw Gyffes.” In fact, this is far from accurate, as both Math (Lleu’s great uncle) and Gwydion (Lleu’s foster-father) use their magic to create the perfect wife for the hero, but she ends up being faithless and treacherous of her own free will. Both Math and Gwydion do all they can to help Lleu, both before and after the incident with Blodeuedd, and there was never any malice or ill intent on their part toward Lleu in any of their actions in the narrative. There are also a few other inaccuracies in his theological discussions. In discussing Moore’s proclivity for structure on page 204, he mentions that Moore’s comic Promethea was largely structured around the kabbalistic tree of life (at least for the middle part of it), but he says there are twelve sephiroth on the tree, rather than eleven (at least in Moore’s case) or the generally more widespread ten. He also uses the term “dark night of the soul” on pages 252 and 282 (rather more accurately in the latter case, in relation to his own spiritual and magical journeys) without any explanation. It is somewhat common to refer to any difficult or trying time as a “dark night of the soul” for people, but the actual mystical process is something in which one emerges not only stronger, but which is an actual trial imposed by a deity upon their devotee in order to re-orient their priorities and draw them closer to the deity during the process, rather than just after it. It seems somewhat difficult to apply this to the entire “Dark Age” period of comics and of superheroes, since many superhero comics are still caught up in these “Dark Age” mentalities. One theme that does come up repeatedly, however, that is quite useful when discussing comics, fiction and narrative in any form, but also art, religion, spirituality, and magic, is that just because something isn’t “real” doesn’t mean it isn’t “true.” This theme emerges early (p. 56) in relation to the eventual imposition of the Comics Code Authority, but again is reiterated in later chapters (pp. 219-220, 301, 408, 416). This is a very strong, very useful, and very important theme that many people involved in modern paganism, polytheism, and occultism could certainly take more to heart. Perhaps ironically, it is also a theme about which Morrison’s position is in complete agreement with Moore’s. On page 256, Morrison writes, after relating some of his psychedelic experiences, “I have no real explanation for a lot of this but numerous speculations that may find their way into another book one day.” I eagerly look forward to reading such a book, and hope that Morrison finds the time to work on it in the not-too-distant future! While I have some disagreements with Morrison’s theologies at various points — being that I am not a soft polytheist, but then again as Morrison can be characterized as a chaos magician, that does fit better with that general methodology — and I think that the title of this book is a bit overblown and misleading, nonetheless I found this book greatly pleasurable to read, as well as a treasure trove of history and of his own “eyewitness” reports on some aspects of that history. To use a classical image, if comics can be said to form a sort of “Old Testament” of narratives, then Morrison is like Josephus in both his Jewish Antiquities and The Jewish War, making that material more accessible to a wider audience, but also having written a first-hand account of some of the latest “battles” in the long history of that particular tradition.